Cedar Key is one of the oldest ports in the state, and when Florida's first railroad connected it to the east coast, it became a major supplier of seafood and timber products in the northeast. Today it has become a haven for artists and writers who find the unspoiled environment inspirational to their work. Many people visit each year to walk the historic streets browse the shops and galleries, explore the back bayous and enjoy the world-famous restaurants featuring seafood fresh from local waters. The leaders will make every reasonable effort to meet the goals outlined in the itinerary. Please keep in mind that weather or other conditions beyond our control may cause us to modify the itinerary in order to ensure the safety and well being of the group. Day 1 — Participants will meet at Orlando International Airport baggage claim 5A at the bottom of the escalators at noon. Our lodge for the week will be a short three-hour drive away. We will stop en route for lunch at a local restaurant (not included in the trip price). After settling in we will walk down to the beach for some basic kayaking instruction. Dinner will be served Oceanside, just in time to toast our first sunset together. Day 2 — After a huge breakfast we will kayak on the Suwannee river from one spring to another. Taking our time we can witness the changes in nature around us, from hardwood swamp hammocks to coastal delta estuary. We will have ample time to enjoy the wildlife, snorkel, swim, play and explore. Day 3 — This will be our big day of open water sea kayaking. Curious dolphins will greet us as we make our way to old Cedar Key. Have your cameras and binoculars ready for the over 250 species of birds who call these islands home. Day 4 — Wildlife abounds as we start our day with a relaxing paddle through the bayous for an island sunrise. Lunch will be at Atsena Otie Key. The evening will be spent walking John Muir’s “last mile” on the island of Cedar Key. Day 6 — Today will be the highlight for most folks. The van ride is a bit long, however, the payoff is huge. Early in the morning on cooler days enormous populations of enormous manatee gather near Kings Bay in the coastal town of Crystal River. We will slide into our wet suits then slip into the oceans clear water to enjoy a snorkel with the endangered manatee. This is one of the only places in the U.S to swim and touch wild manatee. Make sure to invest in a waterproof camera. On the way back to Cedar Key we will stop in at Manatee Springs again for a sunset hike, snorkel, or both. Day 7 — Spend the morning beach combing or sleeping in. We will leave around noon for the Orlando International Airport. A group of restricted access islands in the Gulf of Mexico. Includes a major seabird rookery and an 1850´s lighthouse on Florida’s highest coastal elevation. Boats are available at Cedar Key. A 31,000 acre limited access preserve between Yankeetown and Cedar Key offers access to canoeists and campers for both freshwater and saltwater fishing, photography and historic site exploration. A unique scrub habitat on the mainland offers walking and bird watching, few marked trails. Cedar Key Museum State Park Established in 1962 and dedicated to St. Clair Whitman, who operated the first museum in Cedar Key. Most of Mr. Whitman´s collection is displayed in the museum. These collections include exhibits on the Timucuan Indians, antique glassware, old bottles, a very complete collection of sea shells, items from the pencil manufacturing days, fiber broom and brush manufacturing, and photographs of old Cedar Key. A prehistoric Indian mound and nature trail outside Cedar Key offers camping, boat ramp, excellent paddling, birding, and picnicking. A new 40,000-acre refuge, offers nature driving and hiking trails for wildlife observation and photography and access to the famous Suwannee River. A Florida first magnitude spring, offers camping, diving, swimming, picnicking, boat ramp, canoe rentals, and an elevated boardwalk through primordial cypress wetlands into the historic Suwannee River. The history of Cedar Key is a long and varied one. Its development can be traced back to the Seminole Indian War and the first railroad to cross the State of Florida. Gulf coast shipping and trading, fishing, and the abundance of cedar for America’s major pencil companies also had a hand in its development. At the southern most tips of the Santa Fe and Suwannee Rivers, its location served as a depot in early Florida history and around the 1850s steamboats filled the rivers. By the 1870s Florida was gaining the interest of travelers who were seeking new opportunities, adventure and better health. Most of these settlers were the travel writers, promoters, and naturalists. Cedar Key was a required stop for many of those travelers and over the years began to receive positive reviews. The fishing industry for the area reached commercial proportions for the area by 1878, and although seasonal became the main source of income for many residents, particularly of the poorer class. At the turn of the century all the major industries relocated from the island posing a new challenge to the community. Gradually tourists began to discover the special qualities of the town and the establishment of a rather important artist colony and resort atmosphere brought the community back to life and where it is today. Our lodging will consist of up-scale ocean front condominiums. Each condo has a couple queen beds, a private bathroom, kitchen, and ocean view deck. Everything in Cedar Key is in walking distance of our lodging. Rooms are double occupancy. 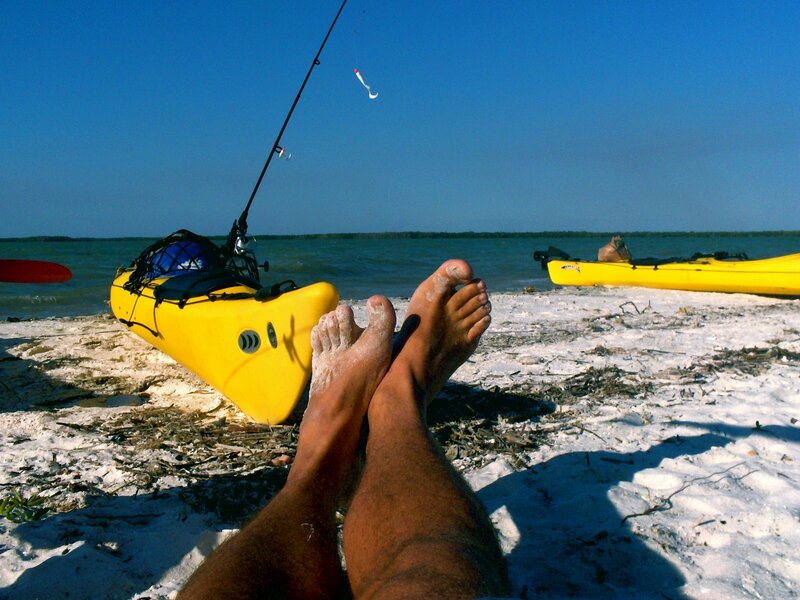 This trip is for anyone interested in exploring several of Florida’s greatest areas by means of a kayak and trekking. Kayaking experience is not needed, however, like most water based outdoor activities, participants should be in good shape and a strong swimmer. The trip leader and assistant are both ACA certified kayak instructors. This would be an excellent trip for first time kayakers. Seasoned kayakers would also enjoy this trip immensely. Most days we will be on the water between 4-6 hours. A detailed equipment list as well as a trip roster will be sent to all participants. Kayaks, paddles, and personal floatation devices (PFD’S) will be provided. If you have a fondness for your own paddle or PFD, bring it! Any one wanting to drive to the meeting point can request a map with specific directions from the trip leader. The closest airport is in Tampa or Orlando, Florida. The leader will be happy to suggest additional nearby destinations for those wishing to extend their stay after this trip. I ask that all participants be in reasonable shape and at least eighteen years old. The leaders will prepare all meals, however, everyone is expected to help clean up. Meals included in the trip fee begin with dinner on the first day and breakfast on the last day. Meals served on the trip will honor and reflect local cuisine. A “Cracker style” low country boil and an oyster bake is also a guarantee.